John Bingham: The Man Who Was Smiley is the first full-length biography of a remarkable and engaging man. Bingham, in addition to writing 18 books, served as an MI5 officer for 37 years and was the model for John le Carré’s George Smiley. The book traces the life of the heir to an Irish barony – Bingham became Lord Clanmorris in 1960 – and a devoted Briton who worked in Fleet Street before joining MI5 in 1940. After eight years of frequently hair-raising, occasionally comic, experiences in espionage he returned to Fleet Street for two years before rejoining MI5 as the Cold War took hold. For the next three decades he had two careers – as a successful novelist and an accomplished agent-runner. A typical day might involve eight hours in Whitehall and three hours of writing before sallying forth for a late-night break-in and burglary of a subversive organisation’s offices. In MI5 John Bingham met David Cornwell who, writing as John le Carré, turned John into the fictional George Smiley. John Bingham: The Man Who Was Smiley describes the friendship between Bingham and le Carré and how that friendship cooled when Bingham, the undying patriot, felt that le Carré had betrayed the ethics of the British Security Service. Bingham also achieved success as an innovative writer of crime and espionage novels in the 1950s and 1960s. His early books, My Name is Michael Sibley, Five Roundabouts to Heaven and The Third Skin were notable for their realistic descriptions of police methods and their grasp of interrogation techniques – techniques that Bingham had developed as an MI5 officer from 1940 to 1948. More interested in the “Whydunnit” than the “Whodunnit”, Bingham perfected the psychological thriller, building his stories with dispassionate objectivity. Alfred Hitchcock, an admirer of his work, adopted three of his books for “The Hitchcock Hour”, one of which, A Fragment of Fear, became a Universal film, starring David Hemmings and Gayle Hunnicutt. Drawing on the published and unpublished writings of the book’s subject, on declassified Foreign Office and Security Service documents in the National Archives, as well as interviews with Bingham’s family and surviving colleagues, the book describes the evolution of MI5 policy during the Second World War and the change of direction after the Berlin blockade of 1948. 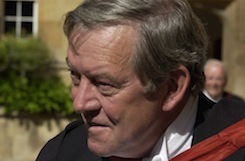 Bingham rejoined MI5 in 1950 after two years’ absence and worked as a senior officer for nearly three decades before finally retiring in 1979. 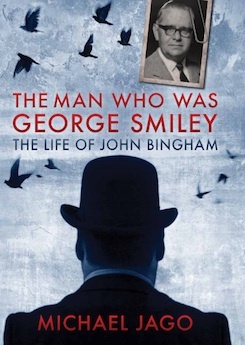 John Bingham: The Man Who Was Smiley is a biography of Jack Bingham rather than a book about George Smiley but the similarities of the real and fictional Intelligence officers is a recurring theme throughout the book. Michael Jago read Ancient History and Philosophy at University College Oxford before settling in the USA in 1980. For 15 years he ran an educational travel business, specialising in the battlefields of western Europe and operated the American College of Travel in Los Angeles. When he sold his travel business in 1995 he launched a football magazine that grew from its California base to be published in several states across the southwestern and midwestern USA. After acquiring a further degree as a (very) mature student at Oxford, he has adopted the writing of biography as his career. ".. brisk and intriguing biography of Le Carré’s old friend." " Michael Jago draws on family memories and Bingham’s own papers to create an affectionate, and in places poignant account of a serious, conventional and ethical man, facing a world where certainties were constantly challenged... very readable for its main character: novelist, patriot and moderate man in a world of extremes." "Jago’s engrossing biography of a disappointed man." " Jago gives a good and readable account of Bingham's life, and does not flinch from the rift that developed between Bingham and Le Carre." "Jago's study is competent and fluent."